Its started to snow here, so we are socked in for a while. 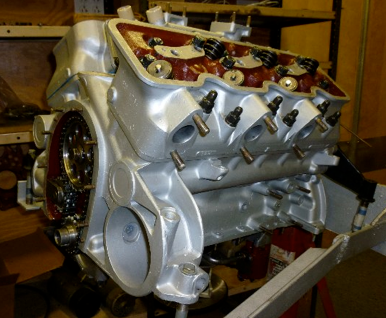 The motor for the B20 is still coming together – but it takes time. Eight months since work started on it… . Walt (in Pittsburgh) continues to plug away, and when the wrenches go down, photos emerge. Of course, better work than photograph, right? The heads are on, the valves in, the bottom is buttoned up, progress. On the left the inside of a combustion chamber in the cylinder head. Its fun to see that Lancia numbered the cylinders – given that once the heads are on, there aren’t a lot fo choices. One wonders who they numbered them for – the assemblers? Later mechanical work? Or just craftsmanship taken to a funny place?